Exactly one-half of the La Sportiva Syborg suit, the Racing Jacket still features full quality. If you are too modest to wear skin-tight pants, you can still benefit from all the handy features found in the upper portion of race suits. 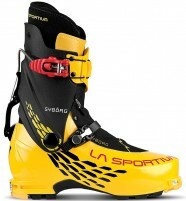 That includes skin stowage, bottle stowage, transceiver stowage, food stowage, and headlamp stowage. You might not even need to carry luggage through the airport with all that stowage. The inevitable pat downs at security might cancel any benefits of that system, however. Outer chests pockets are designed for skins, an avy beacon, and a water bottle. Inner pockets can hold a headlamp, energy bars, maps, and keys to the castle. Breathable materials and ventilated insert on the back keep you cool under fire. Reinforced shoulders reinforce the notion that this is a well thought-out piece. Update 2016/17: Sportiva added a splash of red to the Hawkeye suit. Any chance these will be showing up in bigger sizes later this year? Hi Oscar, it looks like we have one XL on the way, would that work? Is this jacket in EU or US sizing? I assume US? The size chart has a US size M equivalent to EU size L, so I just want to make sure I'm ordering the right size. Thanks! Hi Peter, yes we use US sizing in the drop list. The M is an EU L.
Overall: Five Stars for an excellent alternative to a full one-piece lycra suit for racing or to a soft shell for touring, with pockets a plenty. Only possible downsides for this type of clothing article are the lack of a hood for extremely cold weather and the lack of full-zip ventilation for extremely warm weather. Background on product familiarity: Purchased in Fall of 2014. I’ve also used three different models of lycra full race suits for comparison. 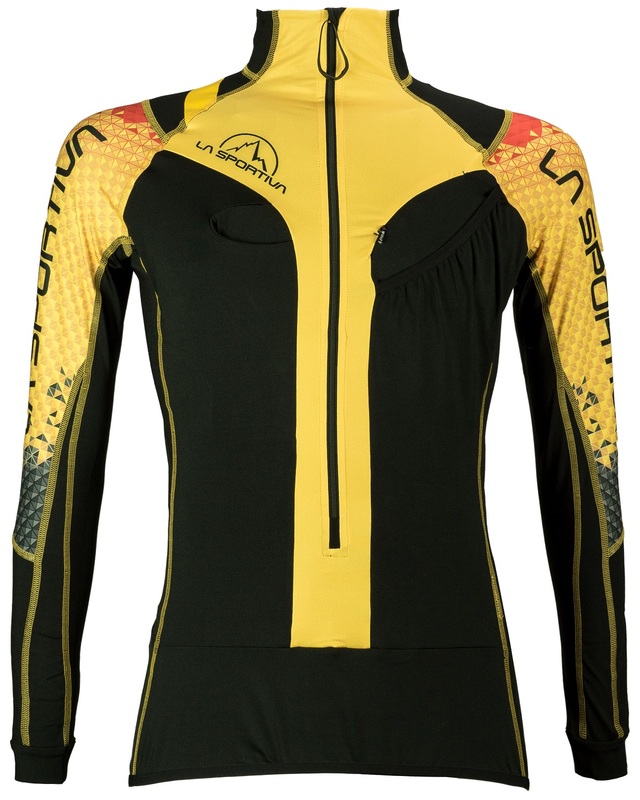 First, the first impressions out of the box: If your goal is more modesty than allowed by a full one-piece lycra race suit, then unfortunately you’re up against six different La Sportiva brand name announcements plus the striking black-and-yellow color scheme. And the fit although spot-on the sizing chart is very slim. Inside the suit are two pockets identical to one of my race suits: each pocket can hold a pair of race skins or a single wide touring skin … or whatever else you might want to put in there, although remember that these pockets are very exposed when the jacket is unzipped while skinning in warm weather. And speaking of warm weather, the zipper isn’t quite full-length, although it’s far longer than on a typical pullover. So although it doesn’t vent as well as a fully open soft shell or windshirt all flopping about, better than a suit since you can take if off entirely (without your pants falling down, as will eventually happen when attempting to skin with a suit top removed from your upper body). And like many race suits, the back has even more breathable material. On the outside are three separate pockets: a zippered pocket to keep your beacon in compliance with ISMF 5.1.16 and/or to keep your car key with you; a smaller pouch-type pocket for a gel flask, hat, sunglasses, etc. ; and, a large pouch-type pocket that is a tight squeeze for a pair of race skins or a small soft water bottle. Missing is a hood, but the suit innards up front have material to keep your lower torso warm, and the hem has grippy material to keep the jacket from riding up over any overlap with your pants. Second impressions, in use: I’ve shied away from wearing my race suit for “real” touring because I like the extra weather protection of tights-style ski pants and also because I dislike the inability to remove a race top if I’m majorly overheating and sweating up the lycra. But this jacket now provides me with all the advantages of a race suit top without the disadvantages, thereby enabling me to diverge even further from any resemblance with a normal ski tourer in the backcountry. Third impressions, for long-term durability: The sewing and reinforcements all seem to be excellently designed and constructed, but obviously anything lycra is not intended for bushwacks. So maybe I'm mainly happy because of the excellent snow and excellent weather on this summer 2016 Mount Hood tour, but the Syborg top also helps!